3)	Multi-Purpose Dams are designed to reduce peak flow during spring snow melt and summer rainstorm runoff events by retaining water for a short period of time, and to store water for summer use. 50% of the dam storage capacity is retained for seasonal use. This may include stock watering, small scale irrigation, wildlife habitat, fish rearing, and groundwater recharge. The small dams store water in pools which are generally the size of small ponds. They have reduced damaging peak stormwater and spring runoff flows by up to 90% at individual sites. At the base of the 29 square mile watershed, peak flow reduction has been measured at 25% (AAFC 1995). Deerwood’s efforts are now saving two local municipalities in excess of $50k per year in reduced costs for the maintenance and repair of roads, bridges, and drainage ditches. These savings are expected to occur for at least 50 years into the future (Oborne 1995). Many other jurisdictions have been exploring adoption of this approach, which may result in significant returns for farmers, municipalities, and the environment. 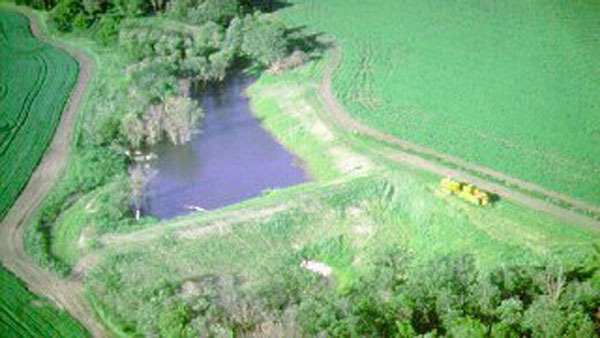 Many small dams are located in former wetland areas (Figure). Twenty-six headwater retention structures now manage 30% of the 18,000 acre South Tobacco Creek watershed, resulting in a 25% reduction in overall peak flows. 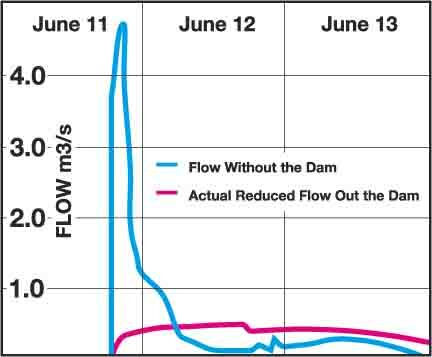 Local, high intensity runoff has been reduced by as much as 90% downstream of individual dams (AAFC 1995). At various rainfall runoff intensities, the modeled effect of Deerwood’s dams have been compared with those estimated for a larger control structure. Projected peak flow impacts indicate comparable effects, particularly with more common runoff intensities (i.e. 1:50 events). Trends of: reduced flooding and soil erosion, improved water quality, and lengthened runoff periods would be expected according to the PFRA model, which predicts Deerwood’s dams to be effective in reducing peak flows throughout the watershed by 25% and 19% in summer storms and spring snowmelts respectively (Figure). 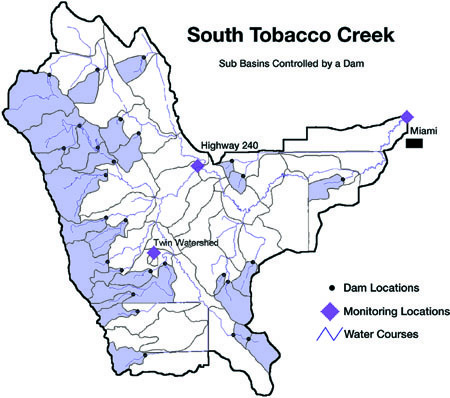 Individual Deerwood dams have reduced downstream peak flows by 90%, while 26 dams within the South Tobacco Creek watershed have been estimated to reduce overall peak flows by 25%.